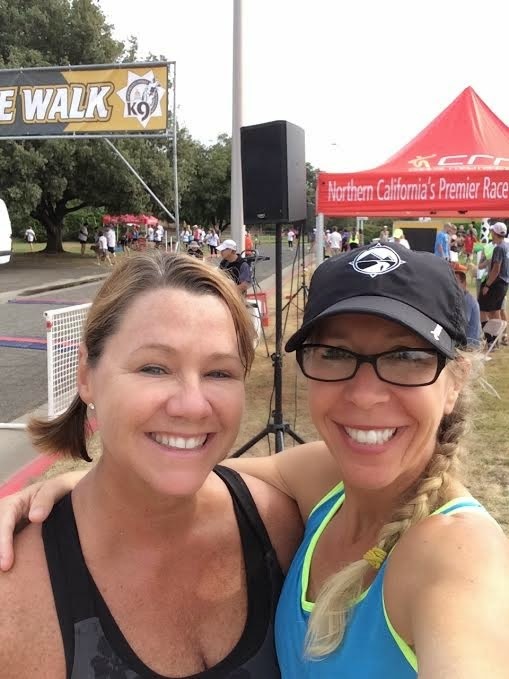 So a couple of weeks ago, I ran this 5K and it was pretty awesome, but I totally didn’t blog about it. Oops! I ran it with a client of mine, pacing her to a huge PR, which was very exciting and very nearly puke-worthy (for her). She did such a great job, shaving 15 seconds per mile off her previous best pace. I was so bummed that she didn’t place in her age, though – she came in 4th – because I ended up walking away with 2nd place AG hardware. Again… oops! I felt sort of bad about that. It pretty much goes to prove that placing well in your age is all about who else shows up, the real win is a PR. 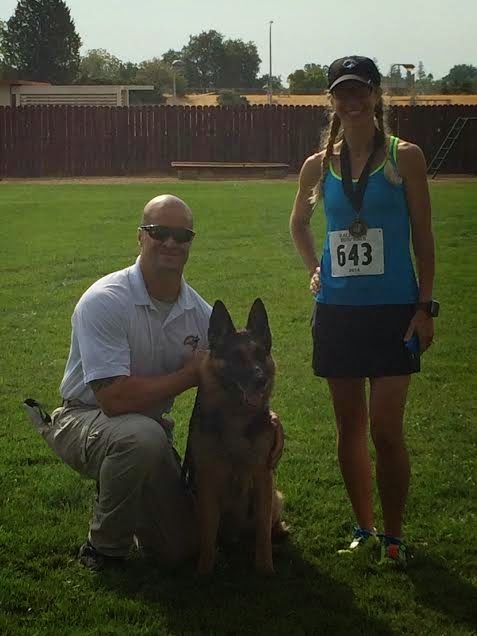 The race benefited the Sacramento Sheriff’s K9 Association, so there were lots of dogs around. I love dogs, but have a healthy respect for the working ones, as evidenced by the arm’s length I kept from this one. I totally thought I was standing right next to him. LOL! I think I didn’t blog about the race because, well, to be honest, it kind of sucked. In fact, it was really strange accepting an AG award for a race that was a Personal Worst time for me! I felt guilty that I got an award and my client didn’t, when she was the one who had run so very, very hard for it. And then later I felt bad because she really struggled with accepting how hard racing is, mentally and physically. Like running as hard as we did almost took the joy out of running for her. As a trainer, I have to accept (some) of the limits my clients want to put on themselves, but this one was hard for me. She has it in her to run fast, but she’s choosing to run for fun instead. The competitor in me is still trying to wrap my head around that. I mean, obviously, I run for fun at longer distances, but at a 5K? That’s all about speed, baby. So let’s talk about speed, shall we? I have none. This summer has been really, really hard for me. I took time off after the Gold Rush 50K, and really thought I was ready to get back to training. June’s mileage was low, but I managed a fast-for-me 5K and was excited about ramping up the miles again for the CIM in December. But then July came and went with a mediocre half marathon and every mile seeming harder and slower. Every time I’ve gone for a run lately, I’ve come home feeling worse and more worn out than when I left. I’ve started dreading running, which I can honestly say has never happened to me in the almost 8 years I’ve been doing this! I kept telling myself that it was the heat, it was my schedule, it was this or that, but in spite of running slower and taking more days to rest, I could still feel myself dragging down even worse, rather than getting better. I can’t remember another time in recent years when I have felt so utterly drained. Adding to the fatigue has been these awful allergies, that I thought I had kicked to the curb after this spring, but have come back with a vengeance this past month. My chest feels tight all the time and my breathing always seems labored. This, in case you were wondering, is not exactly a winning combination for running well! Uncle! I can’t handle this! So off to the doctor I went. A thousand vials of blood and a lung capacity test later, here’s what I know: I’m anemic right now, with iron levels way under the normal range, and there’s a possibility that I’ve got some allergy-related (or possibly exercise-induced) asthma. How does a person who eats as healthfully as I do and exercises as often as I do suddenly have health problems like this at age 44?? So freaking crazy! And yet, in a weird way, such a relief to put a name to all the suckage I’ve been feeling. Honestly, I was a tiny bit worried that all the tests would come back normal and the doctor would tell me I was just being a big baby. Dr. Google has assured me that my iron loss came about from overtraining (rather than scary internal bleeding or some such thing), so I’m taking days off from running like it’s my job. Sadly, though, my actual job does include running with a handful of clients, so I’m still doing that, but thankfully that tends to be at a manageable pace and lower mileage. I’m going to give it a couple of weeks of rest. We’ll see how I feel then. I’m glad I still have so much time before the CIM – I have several other races on my mental calendar, but I haven’t plunked down money on any of them, so it’s not a loss if I can’t compete. I have high hopes of getting back to the business of being badass pretty soon. Hi there! Fellow (and local) runner here. I run ultras AND I have low iron. I feel your pain as well as struggle to breathe! For me, it is a combination of things. Over-training, having Celiac as well as approaching periomenopause (at least that is what my Dr thinks). So I take an iron supplement. I tried not doing so, but I can’t deny how much better I do feel with a bit more iron in my system. Good luck and I’ll see you out on the trails or road at some point!